Our Brush Strokes stencil pattern echoes a popular chevron or herringbone design, with a carefree artistic twist. 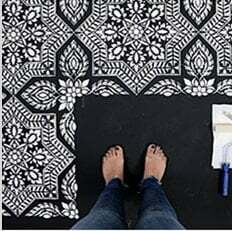 This stencil design is perfect for accent walls, the entire room, furniture, or even beautiful stenciled curtains. Our wallpaper stencils feature an easy and intuitive registration system for accurate alignment. Please watch our How To Stencil videos to learn a simple allover stenciling technique. And make sure you watch our short step-by-step <ahref="/how-to-stencil-videos.html" alt="how-to-stencil-video">Video Tutorials! Most of our stencils do not require the use of spray adhesive, however this Herringbone wall pattern can definitely benefit from it. If you want to minimize paint seepage or are using high contrasting colors, spray adhesive is very helpful (Elmer's spray adhesive seems to be the best). Make sure you shake the can well and lightly mist (not drench) the stencil, and let it dry for a moment before positioning it on the wall. This step will prevent the adhesive residue transferring to the wall. You'll need to re-mist the stencil after a few repeats. Clean-up tip: Spray the stencil with Simple Green to help to remove adhesive residue.